We are committed to reducing our impact on the environment. KPMG member firms are committed to reducing their impact on the environment, addressing local environmental challenges and working with clients to advance environmental sustainability. • serving as leading providers of climate change and sustainability services for our clients. 2. The Statement on Fiduciary Duty and Climate Change Disclosure by the Climate Standards Disclosure Board, which aims to bring climate change disclosures in mainstream corporate reports, given the disclosures relevance to investors. For more information, visit www.kpmg.com/cop21. We are committed to reducing our impact on the environment, addressing local environmental challenges and working with clients to advance environmental sustainability. 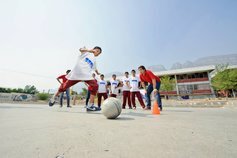 Our actions include: achieving ambitious emissions reduction targets; developing new approaches to account for natural and social capital; supporting collaborative projects with partners, such as the UN Global Compact and the World Business Council for Sustainable Development (WBCSD); and serving as a leading provider of climate change and sustainability services for our clients. to work with our partners, employees, suppliers and clients to help them reduce their climate change impacts. The GGI started with an ambition to reduce our combined greenhouse gas emissions per full-time equivalent (FTE) employee by 25 percent by 2010, on a 2007 baseline. We achieved this target. A new target was set in 2011 that seeks a further 15 percent reduction in net emissions per FTE by 2015, compared to 2010. As of 2013, we have achieved a 10 percent net emissions reduction. Furthermore, 27 percent of our total purchased electricity is now procured from renewable sources. Environmental sustainability statistics cited above are based on aggregated results of a group of KPMG firms representing 85 percent of full-time equivalent KPMG people globally, which are used to estimate total emissions from all KPMG firms. “Water is essential for life. It is also crucial for business and for growth. Cycle for Water is a great opportunity for KPMG to challenge our people, clients and the communities in which we operate to make a difference by supporting Theo and Simon as they Cycle for Water and champion clean water for sustainable development”. KPMG International is supporting two Frenchmen, Theo Rohfritsch and Simon Valdenaire, as they Cycle for Water over 25,000km from France to New Zealand, with the message of clean water for sustainable development. Over the 12 months of the journey, Theo and Simon will cycle across 21 countries, raising awareness of the importance of clean water in achieving the UN’s Sustainable Development Goals. For more information please visit www.cycleforwater.com. The GGI started with a pan-KPMG network ambition to reduce combined greenhouse gas emissions per full-time equivalent (FTE) employee by 25 percent by 2010, on a 2007 baseline. We achieved this target. A new target was set in 2011 that seeks a further 15 percent reduction in net emissions per FTE by 2015, compared to 2010. As of 2014, we have reduced our net emissions per FTE by 10 percent since 2010. This brings us closer to our goal of a 15 percent reduction by the end of 2015. Furthermore, 27 percent of electricity purchased across the KPMG network is now procured from renewable sources, including on-site solar at a few facilities, or from renewable energy certificates and green tariffs. We view material climate change risks as those that will significantly disrupt the provision of KPMG services. We view material climate change opportunities as those that provide significant opportunity to improve our business operations, reduce operating costs and/or offer new services to KPMG member firm clients. Since 2010, KPMG International has responded annually to the CDP (formerly known as the Carbon Disclosure Project). Our most recent response, which includes detailed information about our performance in managing our GHG Emissions is publically available. Our response also provides further examples of the benefits associated with our program. Environmental sustainability statistics cited are based on aggregated results of a group of KPMG firms, representing 83 percent of full-time equivalent KPMG people globally, which are used to estimate total emissions from all KPMG firms. 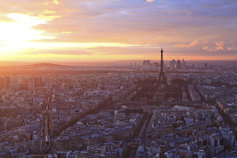 KPMG addresses the COP21 climate talks and their potential impact on our clients.